The number of gamers in the world exceeds 2 billion. This number is higher than the population of China today. The competitions in game industry gain almost the same status as traditional sport contests. The winner’s awards reach 25 billions of dollars and the internet audience who watches it online is more than hundred or thousands of users. Big corporations tend to buy streaming services for hundreds millions of dollars. Championships take place in big scale stadiums or cyber arenas. Organisations earn money on contests by sponsoring the big brands while cyber sportsmen gain funds on the online broadcasting and blogs. The leading gear fabrication companies create its own community and actively produce events to bring new bigger audience, such as Asus. The number of devices and accessories for professional gamers is growing every single day. 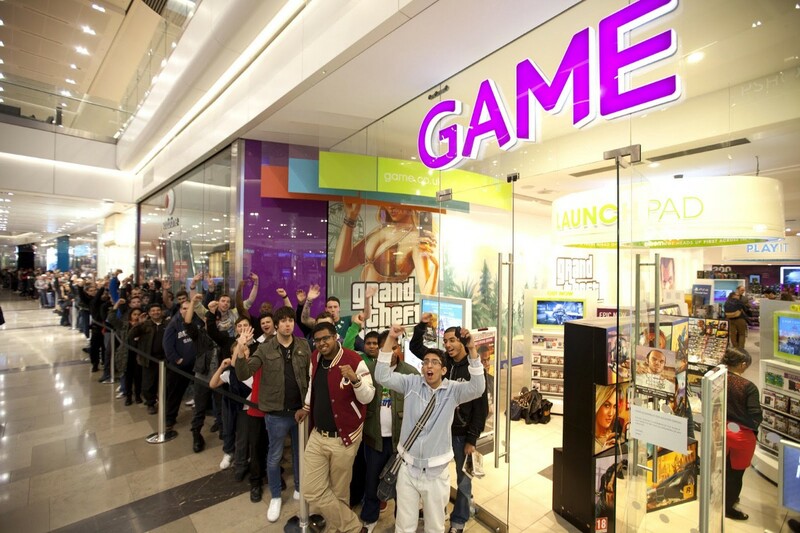 As for the game sales, the majority of forthcoming games have an immense circulation from the very beginning. For instance, Call of Duty : Black Ops 2 earned more than $500 million in a release day (The release date was at the end of 2012.) In two weeks, game sales reached a million dollars. This scenario is specific for game industry. Comparing to the film industry where none of the movies ever reach this high profit within this short timeline. Avatar by James Cameron needed two more days comparing to Call of Duty to reach the same revenue. In September next year the new Grand Theft Auto V, a cultural patrimony of game industry, had a release and earned more than a billion of dollars in three days. Take-Two company that owns Rockstar Games and 2K Games claimed that it earned the main part of the revenue in a day after release. It was an extreme success that no one could achieve before. In short, the game industry is the most profitable segment of the entertainment industry nowadays, proved by numbers below. 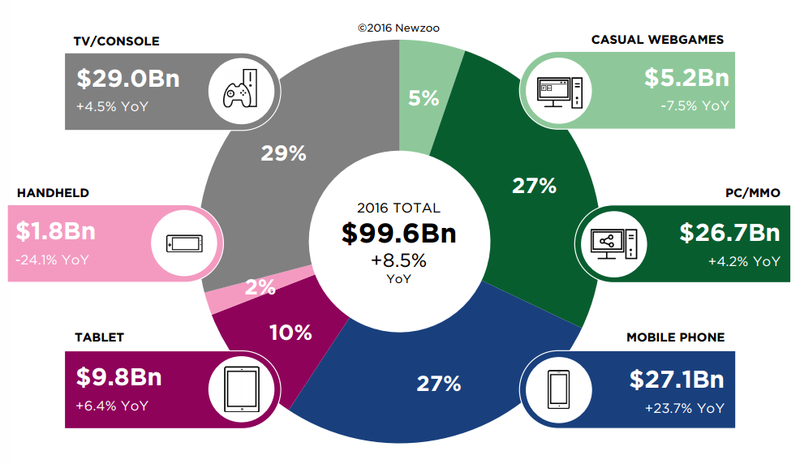 According to 48 pages of Newzoo’s research in 2015 the profit of game marker was more than $90 billion dollars. The situation is very similar to 2016 which profit is around $100 billion but there is one interesting aspect to look at? 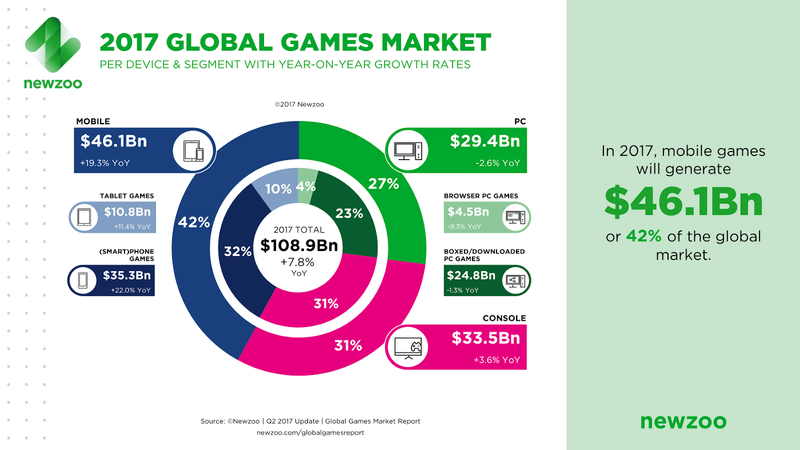 The game market is growing by 8.5% per year while the mobile games is 23.7% (not including handheld growth by 24.1% and tablet games growth by 6.4%.) Smartphones get more powerful core which give extremely successful results in mobile graphics. The following situation give a wide range of perspectives for developers to experiment with ideas that seemed to be a dream before. In 2017 the expected profit of game market is $108.9 milliards which is higher than 2016’s profit by 7.8%. 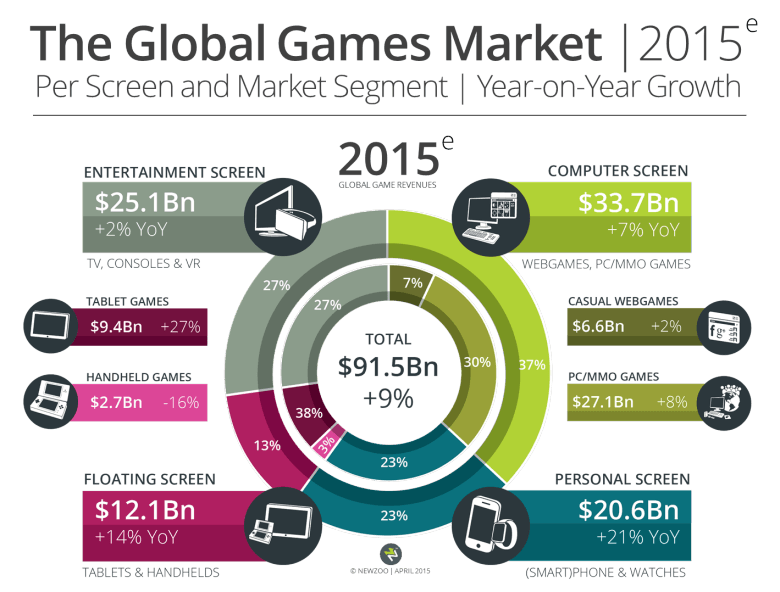 Tablet games — $10,8 milliards, +11,4% yearly growth rate. Smartphone games — $35,3 milliards, + 22,0% yearly growth rate. Downloaded games for PC — $24,8 milliards, -1,3% гyearly growth rate. What does the statistics mean for PC-gaming? 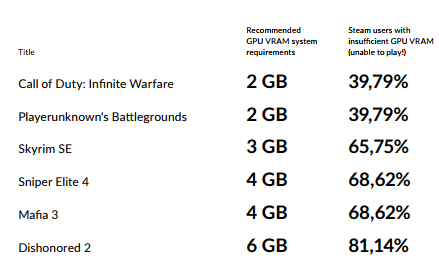 Firstly, personal computers lose their status as game platforms. Why is it happening? One of the main reasons is the higher requirements to the gear, video cards, processors. If you want to play on modern PC that can play the new release games, you need to spend at least $300 in a year in order to follow the new releases.There is no alternative, so as a result gamers tend to play on smartphones and consoles. Only a few PC-gamers can play brand new titles. If we look at the statistics of Steam for game gear and take Dishonored 2 as a benchmark, only 19% of gamers can jumpstart it in high graphics settings. What is the decision them? Playkey is taking a new level in game industry by suggesting a decentralized system based on blockchain of technology to gamers. We aim to take our own part on game industry market. Instead of yearly spendings on updating the PC, gamers have an alternative option of streaming P2P-model. ICO-campaign Playkey starts on November 1st while the presale is open now for 60 ETH (or $17k). You can receive a discount for PKT-tokens by 25%. Playkey tokens are the service currency that allow not only gaming but in the future the parlayed for games, game competitions and payment for online broadcasting as well. You can leave a request for presale here. An alternative opportunity for service promoters is to gain tokens in exchange of supporting the development of ICO-campaign. We put in pledge 1,5% of all tokens on our Bounty-program which is 1,500,000 PKT tokens ≈ 13,500 ETH (ICO Price) ≈ 3,915,000$. You can receive these tokens by supporting ICO-campaign on FB, Twitter, and Bitcointalk forums. You can read more about ICO-campaign Playkey and learn how to receive more tokens on Bitcoin forum.